Mathieu Bastareaud will miss France's Six Nations opener against Ireland on 3 February after receiving a three-week ban for making a homophobic remark. The Toulon centre, 29, admitted verbally abusing Benetton flanker Sebastian Negri during Sunday's European Champions Cup tie. World Rugby rules state the offence carries a minimum six-week ban, but it was halved because of his guilty plea. He will be free to play again on Sunday, 4 February. The European Professional Club Rugby committee hearing the case upheld the citing complaint against Bastareaud, saying that the nature of the verbal abuse warranted a red card. 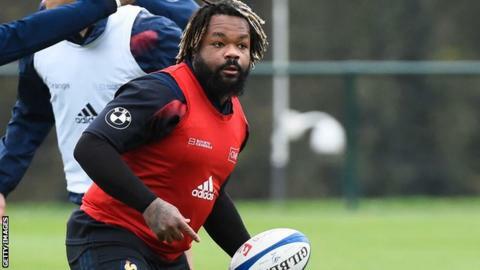 France coach Jacques Brunel, who took over from sacked veteran Guy Noves last month, had included Bastareaud in his Six Nations squad announced earlier on Wednesday. Brunel has recalled Clermont half-back Morgan Parra for the first time in two years. But there are no places for Montpellier number eight Louis Picamoles and Toulon fly-half Francois Trinh-Duc, who has lost his place with both club and country to Anthony Belleau.